So this post is pretty much impromptu and totally random in every sense. This one’s actually a mail to a friend who was enquiring about tourist hot spots in Singapore for her family (specifically her mom and sister). Although this is by no means a comprehensive guide to the Lion City, it’s still a pretty nice primer for folks visiting the little red dot, especially during the holiday season. Most of the city is pretty much oriented towards shoppers, so there are ginormous malls in most areas. Although shopping isn’t on their agenda, your sister and mom may enjoy just walking around these retail meccas for a while. Most notable ones are Takashiyama (Orchard road), Ion Orchard (Orchard Road), Raffles City (City Hall), Plaza Singapura (Dhoby Ghaut), VivoCity (Harbourfront) and Suntec City Mall (City Hall). And with the holiday season looming around the corner, these malls and shopping districts will be lit up like the 4th of July and will be absolutely picturesque! If they enjoy taking walks around the city then I’d recommend taking the hop-on hop-off city tours. They offer the flexibility to explore pockets of the city such as Little India, CBD, Matina Bay Sands Hotel & Casino (the casino doesn’t compare to the big Vegas ones, but is quite good), Singapore Flyer (similar to the London Eye), Botanical Gardens and Orchard Road. The most prominent (and I think the only one) player is Duck & Hippo. They offer great packages to combine multiple touring options. The Singapore Zoo and Bird Park are also great destinations for a day trip and offer some great souvenirs to take back. For a unique experience they could possibly try the Night Safari which is supposed to be quite good. If they enjoy outdoor activities and wanna enjoy a nice bicycle ride (or skates!) along the shore, then they should check out East Coast Park (or ECP as its called by the locals). They can rent a cycle here and ride along the almost 7.5 km stretch of beach and park along the south eastern portion of the island. If they can spare an entire day, they can also head to Pulau Ubin, a small island to the north east of Singapore and just a 30 min ferry ride away. Its a relatively under-developed fishing village but has some great cheap seafood options and an amazing bicycle trail that runs along the entire island. If they’d like a short trek, there are a few options for that as well. Bukit Timah, Mc Rithcie Resevoir and Mt Faber are local trek hotspots. Although don’t expect the rustic trekking trails of Maharashtra since all of these are pretty much man-made and have paved roads running through them. In fact, Mt. Faber also has 3-4 hill side fine dining restaurants. There aren’t too many great beaches (well not the kind you find in other SE Asian countries at least!) but a famous touristy beach is the Siloso beach on Sentosa, which another island to the south of mainland Singapore. Apart from the beach, there are also a rotating observation tower, Tiger Tower (so called because it’s sponsored by Tiger Beer), The gigantic version of the original Merlion Statue and quite a few other activities and sights. Sentosa has a lot to offer and is a good day’s outing. Sentosa is where they will also find Universal Studios which makes a good all-day outing. I’m not sure if the information I’ve provided is what you were looking for exactly, but do let me know if you need any specifics and/or some other details or options. The pics may give you a better sense of what to expect at the various spots. 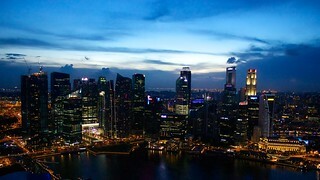 Like I said, this isn’t an article for the Lonely Planet or Frommer’s Travel material, but IMHO it’s a pretty decent writeup about what tourists can expect when visiting Singapore. Why I Like The Robot Over The Fruit. As always … its a pleasure reading your blog! Why I Loved Batman v… on Suckered! © Abhijeet Gandhi and Stochastic Musings, 2006-2015. Unauthorized use and/or duplication of this material without express and written permission from this blog’s author and/or owner is strictly prohibited. Excerpts and links may be used, provided that full and clear credit is given to Abhijeet Gandhi and Stochastic Musings with appropriate and specific direction to the original content.